This polypropylene horizontal centrifugal pump is a technically horizontal single end suction standardized back pull out process pump, specially designed to fulfill the miscellany requirements of the chemical industries. This pump is manufactured using top grade polypropylene copolymer material to convey considerable inertness against chemicals and thereby is also illustrious as a PP pump (polypropylene pump). The entire manufacturing of this PP pump is carried out by means of the moulding process to create a shield of the PP material against water and corrosive chemicals and hence protect all the wet end parts of the pump and impart longer service life to thereof. This polypropylene pump has accredited in assorted industries for delivering no leakage and no failure experience throughout the lifespan, and is apparent confirmation of its ability to outperform even under the harshest conditions. The use of the polypropylene material and moulding construction protects the pump from corrosive chemicals and hence ensure longevity. All the wet end parts are covered through the moulded construction to withstand corrosion and erosion. The impeller is semi-open type hydraulically balanced by back vanes, used in our all pp pumps to suit both clear & polluted fluids. 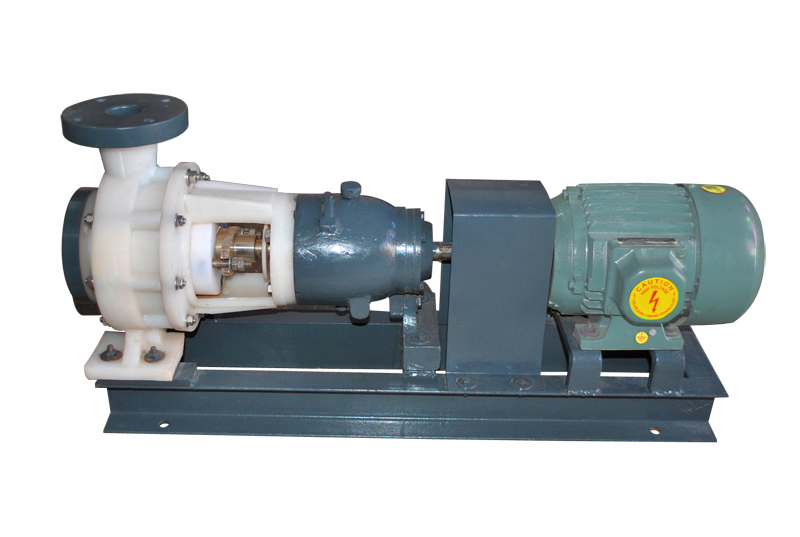 Distance piece of pumps is made from Polypropylene material and hence no corrosion problem and pump leakage problem. The bearing bracket of this Polypropylene pump is made from heavy-duty graded casting coated with anti corrosive paint. The centrifugal design of the pump ensures noise free and vibration free operations. The pump rotating element can be reversed toward the motor without interrupting the suction or deliver pipeline operation, thanks to the back pull out the configuration of the PP pump. The motor stays fixed to base throughout the operation, whereas the pump rotating element can be taken apart into its component without efforts. You will find maximum dimensional interchangeability in the design of "VIJAY" Polypropylene Horizontal Centrifugal Pump. "VIJAY" Pumps require minimum spare parts and saves you significant maintenance costs in the long run. PHOSPHORIC ACID PLANTS : H3PO4, H2SO4, HF and their mixtures with or without solid (gypsum) up to 40% conc. GAS WASHING PLANTS : Scrubbed liquids containing CL2, BR2, F2, I2, SO2, SO3, CO2, NH3 Gases etc. with solids replace hastalloy. CAUSTIC SODA PLANTS : Chlorinated brine, conc. HCL, Dilute H2SO4 etc. The offered polypropylene pump (PP pump) may possibly run at 1440 & 2880 RPM respectively, and a range of impeller diameter for each pump size gives a wide spread of performance. Our service technicians can meet you any where in INDIA at a short notice spares are available ready stock our constant astaire is to ensure that a "VIJAY" Pump never causes you downtime once you have put it to operation.